This caboose started as a Great Northern 19 foot 4-wheeler. In 1909, the states of Washington, North Dakota and Minnesota enacted laws prohibiting the use of 4-wheel cabooses after January 1910. The Great Northern Railway rebuilt their fleet of 4-wheelers to 25 foot 8-wheel cabooses at the cost of $262.05 per car. 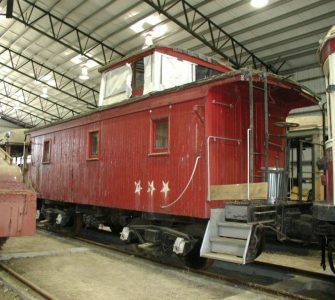 The SP&S purchased the caboose in 1910 and renumbered it as #713. In 1944, it was rebuilt and received a steel underframe and new trucks. It was sold to the Tite Knot Pine Mill of Redmond, Oregon on September 15, 1964. It was next sold to Bigelow Machinery Company and moved to Columbia Blvd. in Portland where it was used as an office. In 1994, it was donated to the Museum and moved to Brooks. No record has been found of the original GN number. Number 713 was never electrified nor had indoor plumbing.